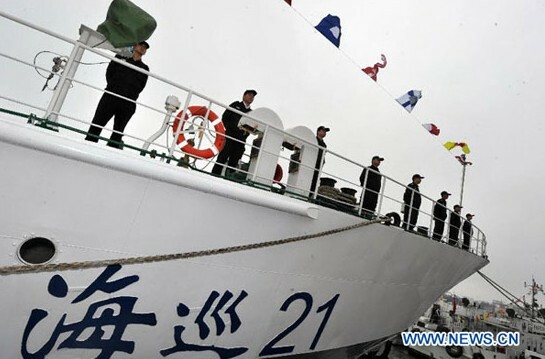 A ceremony is held to celebrate the enlisting of patrol vessel Haixun 21 into the Hainan Maritime Safety Administration in Haikou, capital of south China’s Hainan Province, Dec. 27, 2012. 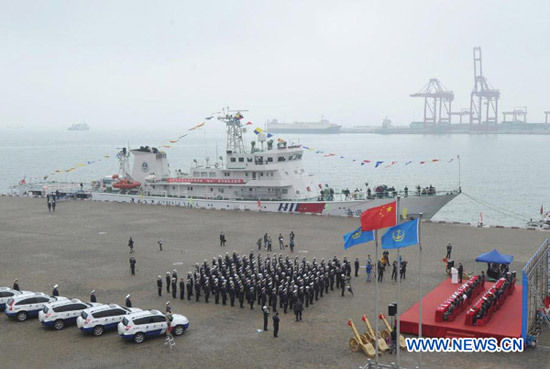 China on Thursday sent the oceangoing patrol vessel equipped with a helipad to the South China Sea, the first of its kind to be put into service there. Haixun 21, under the administration of the Hainan Maritime Safety Administration, will monitor maritime traffic safety, investigate maritime accidents, detect pollution, carry out search and rescue work and fulfill international conventions, according to authorities. Haixun 21 is 93.2 meters long with a maximum sailing distance of 4,000 nautical miles (7,408 kilometers) without refueling. Its maximum sailing speed is 22 knots (40.74 kilometers per hour). The helipad, located at the stern, is about 21 meters long and 11 meters wide.